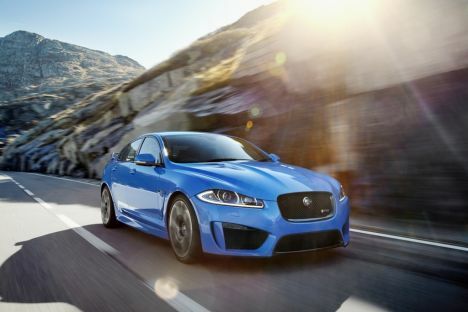 The XFR-S is Jaguar's fastest, most powerful and agile sports saloon ever and builds on the already acclaimed XFR to create an even more focused product. Power and torque of the 5.0-litre supercharged V8 have been increased to 550PS and 680Nm - up 40PS and 55Nm over the XFR, and with no impact on fuel consumption or emissions. Comprehensive front and rear suspension upgrades maximise response with lateral stiffness up by 30%. Electronic active differential and Dynamic Stability Control systems have also been recalibrated to enhance handling characteristics. New, wider, 20-inch 'Varuna' forged alloy wheels are shod with bespoke tyres to maximise grip. Aerodynamic changes, with extensive use of carbon fibre construction, reduce lift by 68% and give the car an assertive appearance. Exclusive interior materials include carbon leather and contrasting highlight micro-piping and stitching. "Sporting character is evident in all Jaguar saloons. In the XFR-S that character has been amplified, the result being a truly engaging car with a combination of technical innovation, assertive design and staggering performance that will satisfy the most demanding of drivers."